A quick preface: here at Cereal At Midnight, we LOVE Indiana Jones. We watched his adventures almost as much as we watched the original three Star Wars films growing up, and we still consider Raiders of the Lost Ark to be perfect in every way. We love Temple of Doom, including the raft-as-a-parachute scene. We love Willie Scott. We think Indiana Jones and the Last Crusade was a fitting end to the series and were satisfied with the trilogy until Kingdom of the Crystal Skull came along in 2008, which we also like. We are okay with nuking the fridge. We are okay with the science fiction slant that came with setting the fourth movie in the fifties. We don't think that any of the sequels are as good as Raiders of the Lost Ark, but we still love them because they feature one of cinema's coolest heroes EVER. We think that all the movies are a little goofy, but the fact that they don't take themselves seriously is one of the reasons we connect with them. That being said, we're getting a fifth movie, whether we think that's a good idea or not. Here are five things we're hoping for from Indiana Jones 5. 5) More Cold War Intrigue. Kingdom of the Crystal Skull was set in 1957, arguably the height of the Cold War, with Eisenhower, the atomic bomb, and the Soviets all playing a part in the story. Given that the fifth movie will be shot somewhere around eleven years after Crystal Skull, the setting will likely have to be the sixties. This is tricky, especially for those of us who believe that Indiana Jones works best as a 1930s pulp hero, which is how he was conceived. 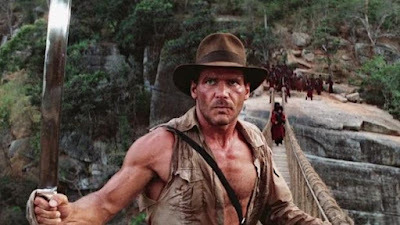 It's important that Indiana Jones doesn't exist in a world that we can easily recognize, as his connections to the historical past are very crucial to the character. He is a professor of archaeology, after all. Nevertheless, there is fun territory to be mined if the story takes place in the 1960s. It was heavily implied in Crystal Skull that Indy had spent time working for the government during the Cold War, and that could be expanded in this movie. The early sixties gave us the assassination of JFK, the Bay of Pigs Invasion of Cuba AND the Cuban Missile Crisis. Wow, sixties Cuba sure would be a good place to go looking for artifacts, wouldn't it? Indy versus Fidel Castro and Che Guevara with the whole world mirroring the revolution going on in Cuba? Add a mystical element to the story, most likely deep in the jungle, and just think of the possibilities. 4) Mysterious Past. Indy's government service aside, one thing that has been a hallmark of the series has been his mysterious past. Though there was an entire television series centered around the events that shaped Indy into the man he would one day become (the multiple-Emmy-award-winning Young Indiana Jones Chronicles), there's still a ton of mystery around the character. Every moment in his life hasn't been filled, and there's a lot that we still don't know. We recognize Indy as a globetrotter who has been everywhere and experienced a ton, but thankfully, Indiana Jones is a franchise that hasn't been mined to death (yet), so there's a lot of gaps in the character's past. Dear Lucasfilm, please don't do what you've done with Star Wars and over-develop it. Leave some room for wonder. That being said, there have been something like fifteen Indy novels that successfully walk the line between revealing too much and giving us new adventures. They even connect well to The Young Indiana Jones Chronicles, which we're totally okay with. In fact, the novels are mostly really good and worth reading, so it is possible to have new adventures without digging up too much of the past, so to speak. Here's hoping they leave the years between Crystal Skull and Indy 5 wide open. We don't want to know. 3) No Shia. It doesn't look like Shia LaBeouf will be returning for this fifth adventure, and that's A-OK by us. It made sense to have him in the fourth film, and we appreciate the groundwork that was laid in that movie so that Indy could pass the torch. Fast forward all these years and Shia has imploded like a star turning into a black hole (not a bad metaphor). There's been a DUI, at least one arrest, and the little fact that he said he doesn't like any of the movies he made for Steven Spielberg, which prompted Harrison Ford to call him "a f***ing idiot." His presence in the Indiana Jones franchise was never all that welcome in the first place, but this is a situation where his appearance could actually ruin the movie before it was even released. It's will be challenging to explain his absence in the story for the fifth movie since they made him such an integral part of the fourth one, but they can do it. We're about to expand on this statement, but Indy doesn't actually need to pass the torch. Mutt's involvement in future movies is completely unnecessary. 2) Shorty, We're Home. One character whose presence has been deeply missed is Short Round. His absence from Kingdom of the Crystal Skull, especially the end, really stinks. This is a character who played a crucial role in Temple of Doom and who Indy clearly loved, serving as Shorty's father-figure. We're not suggesting that Indiana Jones should actually BE a father to Short Round, but it would be nice to have their relationship referenced. The actor who played Short Round, Jonathan Ke Quan, is now in his mid-forties and could actually do some heavy lifting if necessary in the new movie. We would even settle for a cameo, like Indy and Shorty having lunch. This franchise has lost so many of the connections with Indy's past adventures: Denholm Elliot has passed away, Sean Connery is retired, Shia needs to stay away, and Indy's few surviving relationships need to be played up. Give us Karen Allen again. Bring back Sallah! And please don't forget to pass the Short Round. If this is the big finale for Indiana Jones, let's get the band back together one more time. 1) It Belongs in a Museum. We want this to be the last adventure of Indiana Jones. Star Wars, Lucasfilm's other huge success, is a franchise that can go on and on as new characters enter and old characters are phased out. It's a big universe out there, and the good folks at Disney/Lucasfilm have figured out how to tell stories with new characters that people want to see in a galaxy far, far away. 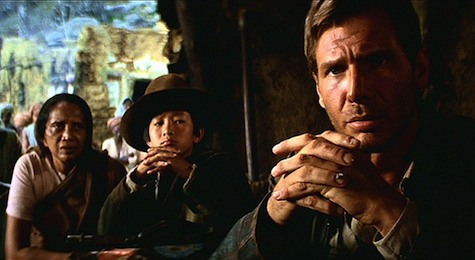 Indiana Jones, on the other hand, was never meant to be a multi-generational tale. The very titles of the films are connected to the name of of Indiana Jones, who himself is a combination of serial heroes and James Bond. Sure, James Bond has been recast many times now, and the serial heroes that inspired Indy were often played by multiple actors (how many men have played Tarzan, for example?). There may have been a time--MAY HAVE--when you could have recast Indiana Jones with another actor to replace Harrison Ford. But by the time Indiana Jones 5 comes out in theaters, the character will have been around for almost four decades of adventures played by the same actor. 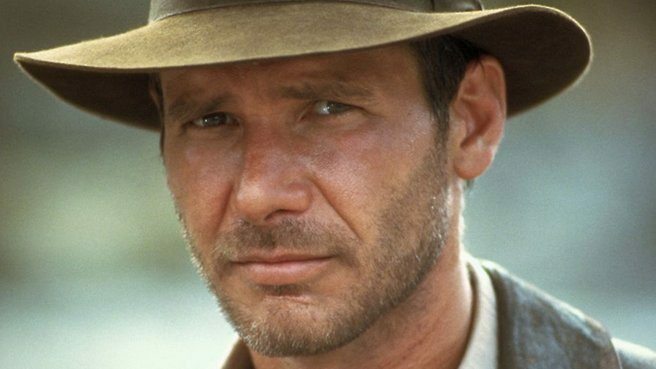 For multiple generations of movie fans, Harrison Ford IS Indiana Jones and he owns the role. Sure, other actors portrayed the character in The Young Indiana Jones Chronicles, but when we think of Indiana Jones, none of us are thinking of Sean Patrick Flanery, are we? Indiana Jones is Harrison Ford, brandishing his whip, outrunning the boulder, and facing off against Nazis in Cairo. He's not a kid learning about jazz music. 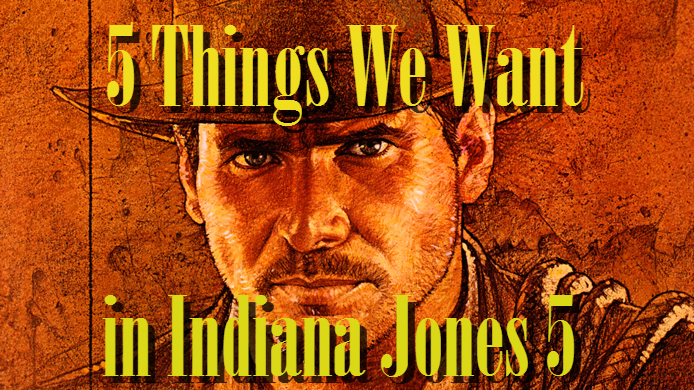 As much as some people would like to see someone like Chris Pratt or Bradley Cooper step in and have the franchise rebooted back to adventures set in the 1930s, we think it's best for Indiana Jones to have one last adventure that wraps up his story. Those of us in our thirties and forties, the kids who grew up with the original adventures, would be mortified to see someone else step in as Indy. Audiences now in their teens and twenties don't seem to have the connection to the character we do, which completely understandable, as there was a 19-year gap between stories. Where is the fan base that would come out to support the further adventures of Indiana Jones should he be recast? If we're being honest, Indy should probably have been left in 1989 when he rode off into the sunset alongside his father (the actual James Bond) into a future that was just as mysterious and exciting as his three original films. With a fifth movie, the opportunity exists to give him a happy ending. Harrison Ford, who was in his sixties when they made Kingdom of the Crystal Skull, will be in his late seventies for this movie. Is this really the Indy that so many of us know and love? The law of diminishing returns is in full view here. You better believe we'll be in that theater on opening night to see Indy, a character who feels like family, as he takes one more ride, but we're not-so-secretly hoping it's his last ride. Don't kill him, though! Just let him go off on another adventure and into cinema history. You want a new Indiana Jones? Don't recast the role; create something new. Indiana Jones was so special to us back in the day because the whole package was all so fresh and fun. He was the pulp hero of the '30s and '40s repackaged for an '80s audience, using special effects that were brand new. If Disney wants to continue in the same mode of Indiana Jones, take what makes Indiana Jones so special and repackage that ideal, that sense of fun and adventure, for a 2020's crowd. Even though Indy was inspired by his cinematic ancestors, there has never been, and never will be, another Indiana Jones. He's one of a kind, and Harrison Ford is the man who brings him to life. See you in the summer of 2020, Indy. We can't wait.